Children’s ear infections usually involve the external ear or middle ear. External ear infections may occur after swimming and are sometimes referred to as “swimmer’s ear”. They cause pain, blockage and scanty discharge from the ear. Mild outer ear infection may settle down on its own. If not, antibiotics may be needed, and are usually given as ear drops. Antibiotics by mouth and painkillers are sometimes needed. If an infection does not get better quickly it may be necessary to take a swab of the ear discharge to assess how effective antibiotics are. In addition gentle cleaning of the ear may be needed using a microscope and small vacuum device. Middle ear infections occur behind the ear drum and may follow a cold or flu. They can cause pain, fever, discharge, and blockage of the ear. In very young children, rubbing or tugging at the ear can be a sign of a middle ear infection. Sometimes middle ear problems can cause loss of balance or clumsiness, poor attention, or behavioral problems. Mild middle ear infection often gets better on its own, or requires only simple painkillers. Antibiotics may be needed when symptoms are not settling or are increasing. Nasal drops, sprays and decongestants are sometimes also given. 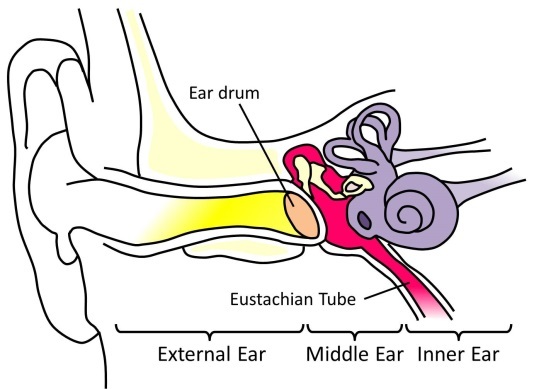 These help open up the eustachian tube, which is a tube joining the middle ear to the back of the nose. Opening up the tube helps air to enter the middle ear and keep it dry. Sometimes, middle ear infections or even a simple cold can trap fluid or mucous in the middle ear. This can be uncomfortable and affect your child’s hearing. The condition is sometimes called “glue ear”. Glue ear can get better by itself and monitoring with ear examination and hearing tests may be all that is needed. Sometimes this is combined with using an Otovent balloon® in which your child blows up a balloon with his or her nose. Studies show that this helps glue ear to recover. Treating allergies and avoiding second-hand tobacco smoke can be important parts of treatment. If glue ear causes a persistent drop in your child’s hearing and there is concern that this is affecting his or her speech development, then a minor operation to insert tiny tubes called grommets into the ear drum may be advised. Grommets help air to enter the middle ear and dry up the fluid. They are usually pushed out naturally by the ear after about 9-15 months. Insertion of grommets is sometimes combined with removing the adenoids. The adenoids sit next to the eustachian tubes and can prevent the tubes from functioning normally. Removing the adenoids can help the eustachian tube to open better and prevent glue ear from recurring.